There is a story behind this new, "Hall of Shame" thing I will share with you now on every Sunday. The whole things started with an innocent email exchange with PJAlau over at Elementhis blog. I'm thinking about heading up there... You interested? I've got Saturday and Sunday free, I have no problem stopping by in Petaluma, picking you up, and heading out there. I was thinking a one day trip - no need to spend the night. 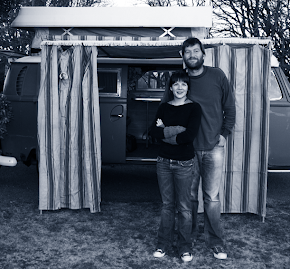 Ah, we are heading out on a 3-day camping trip in Blue to nor cal. I never know why they do bugorama on Labor Day! Totally would have gone if we were planning on camping. I'll be there. I'm travelling most of September, made sure I was going to be back for that one. If you need me to find anything for you, let me know. He delivered the magazines to me at Fall Finnon Fest. Apparently, the idea worked a little as he said he felt foolish digging through stacks of magazines looking for the ones with "chicks" on the cover. Ultimately, the joke was on me. Because I use the scanner at my office for this stuff and that was embarrassing. So, I now add, a "Hall of Shame" (if anyone has better ideas for a name, let me know. The well ran dry when I was thinking about this). 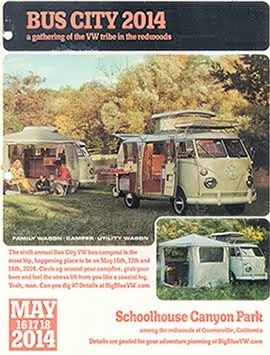 Every Sunday I will post a picture of cringe-worthy cars or events or ads. 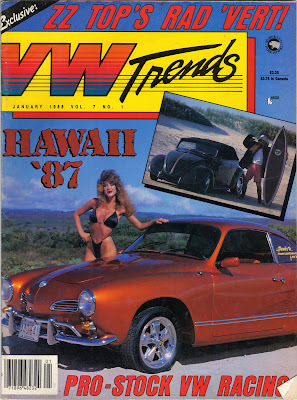 Below, as a kick-off to the Hall of Shame, January 1988 VW Trends (which, it turns out, is much worse that Hot VWs), which features the "Mechanical Maiden" and a well-trimmed model of the era (who looks like she should be on the cover of Guns & Ammo). I'm not sure why the magazines of the era felt the need to put barely clothed girls on the covers but everyone did (check out a Truckin' Magazine from the early 80s for some interesting stuff). ahhh the 80's. 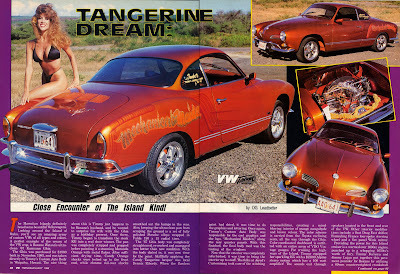 Big hair, "french cut" bikinis, overthetop paint jobs. Neon. Weird pointless swirling things. I'd like to say I miss it, but I really don't.